The logic of any of these is that there is a disequilibrium which offers an opportunity to those who can exploit it. What the analysis fundamentally assumes is that the status quo of firm boundaries is not optimal. Much of the measurement of the balance in the equations assumes that the overall industry is stable and that the problems (technical or market) are largely understood and that there is no learning that needs to happen. Boundaries need to be re-drawn because they are imperfect. Boundaries may have grown imperfect for many reasons: founders/owners were separate, markets and technologies evolve at different rates, resources are inflexible, processes are entrenched and values are outdated. However, all this arithmetic can be safely thrown out of the window if there is a new industry in the making. If there is no balance to begin with because there is an entirely new problem being posited. That is, not only do we not know the answers to technical or market questions, we don’t even know what the right questions are. Early computing, internet, mobile and consumer durables industries went through similar periods of grand experimentation. But the breakthroughs occurred when someone was able to ask (and subsequently answer) a question that nobody had asked before. Jeff Bezos asked, “What would cause people to do their shopping online”. The result was not a lot of unique sites but one infinite one coupled to a logistics and computing service. Having great taste in questions turns out to be the principal quality of the successful industrialist: The creation of economic value and power well beyond the boundary of the firm itself. When the correct question is asked, resources can be efficiently marshaled to answer it. The wrong or incomplete question leads to inefficient resource allocation. And so the architecture of the solution can be built. If the new problem statement is a technical one then an integrated implementation is required. If the new question identifies non-consumption then a modular implementation is required. Each of these approaches suggests different customer sequencing strategies and different application of resources and processes. There is no right architecture for industry creation. What matters is asking the right question. So is Elon Musk, today, asking the right question? The presumptive question seems to be “What would enable everyone to have an electric car?” This is not a great question if it is seen as a continuation of other such questions: “What would enable everyone to have a safe car” or “an efficient car” or “a reliable car” or “a fast car” or “a second car” or “a fashionable car” or “a bigger car”, etc. These previous questions were answered by introducing sustaining improvements or modules to the existing production systems. 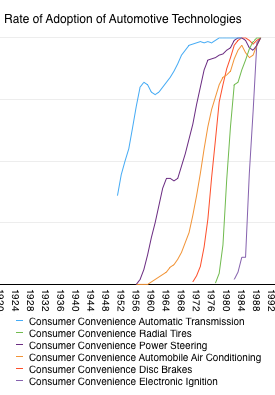 The following graph shows the speed of adoption of various automobile technologies. Hundreds more were introduced and all could be shown to have roughly parallel adoption curves. None of these introductions changed the structure of the industry.2. Tesla seems to be an attempt to incentivize carmakers to build electric cars by setting an example. Maybe it will succeed but this is not a reliable or even viable way to build a defensible business. Envy generates the wrong competitive response, usually. If that business cannot be defended then it will perish and so perhaps will the acceleration. And so we come to the question of whether the defensibility of Tesla relies more on integration. By adding ancillary businesses, can it sustain itself and perhaps eventually pivot away from a commoditizing business (car making)? Through the addition of a business building batteries and then a business selling home power storage and now adding a business selling home solar power provisioning, the car business becomes a module in a larger system. This gets more interesting as a question. The production, storage and use of energy have been modularized over a century and a half from the wood era through the hydrocarbon era. Perhaps the renewable era will be characterized by integration and de-networking or edge-enabled production. If so the energy problem needs to be solved through a re-integration and a new set of business models. Production and consumption can be coupled and thus production can be decentralized. But is the answer Tesla+SolarCity? An integrated approach is appropriate if the technical problems are very difficult and cannot be solved through collaboration across firm boundaries and if buyers are eager for great leaps in performance. Join forces if introducing a new measure of performance, solving an unmet job to be done. A modular approach is appropriate if the problem is one of scale and reach. That is, remain separate if the problems are with finding and building new markets (competing against non-consumption) and if customers are eager for convenience or conformance while being largely satisfied with performance. This is the crucial dichotomy: The business architecture needs to match the point of time in the evolution of the prevailing measure of performance. Consider this proposed integration an experiment to determine what performance we should measure and thus where we really are.